A little under 600 cfs of water flowing out of the east end of the Twin Lakes Tunnel on June 6, 2016. A graph showing the level of diversions through the Twin Lakes Tunnel so far in June 2016. The 618 cfs flowing through the tunnel could be turned back into the river within a week. ASPEN – The Twin Lakes Reservoir and Canal Co. has alerted Pitkin County officials that it soon intends to stop diverting about 600 cubic feet per second of water through the Twin Lakes Tunnel near Independence Pass. The non-diversion of water from the headwaters of the Roaring Fork River, which could begin by midweek and last up to three weeks, could double forecast flows in the Stillwater section of the Fork just east of Aspen, depending on weather and runoff levels. That may inundate the popular North Star Nature Preserve. “We may see a couple of weeks or more where we are not taking anything through the tunnel, and hopefully that doesn’t cause too much flooding on that side,” said Kevin Lusk, a senior engineer with Colorado Springs Utilities and the president of the board of the Twin Lakes Reservoir and Canal Co. 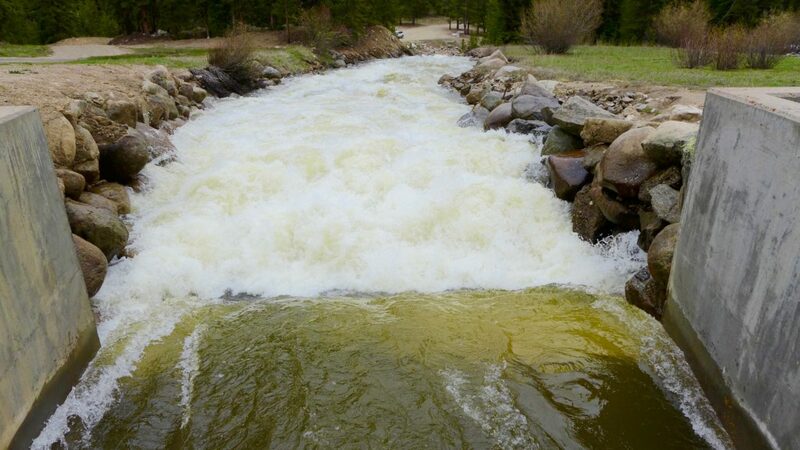 The Roaring Fork, as measured at Stillwater Drive east of Aspen on a federal USGS gauge, was flowing in the 500- to 750-cubic-feet-per-second (cfs) range on Friday. Also on Friday, there was 618 cfs of water being diverted east through the Twin Lakes Tunnel and under the Continental Divide, bound for Front Range cities and fields near Ordway, in the lower Arkansas River basin. The North Star Nature Preserve, with the Roaring Fork River still mostly within its banks, on Saturday, June 11, 2016. The view could change if the Twin Lakes Reservoir and Canal Co. turns back the 600 cfs it is diverting through the Twin Lakes Tunnel. If Twin Lakes does turn off the diversion tunnel by midweek as expected, the Fork could be flowing in the 1,100- to 1,200-cfs range, instead of the 500- to 550-cfs range, as forecast by the Colorado River Basin Forecast Center. This would be the second straight year that Twin Lakes has stopped its diversions from the Roaring Fork headwaters due to plenty of water in the Arkansas basin. 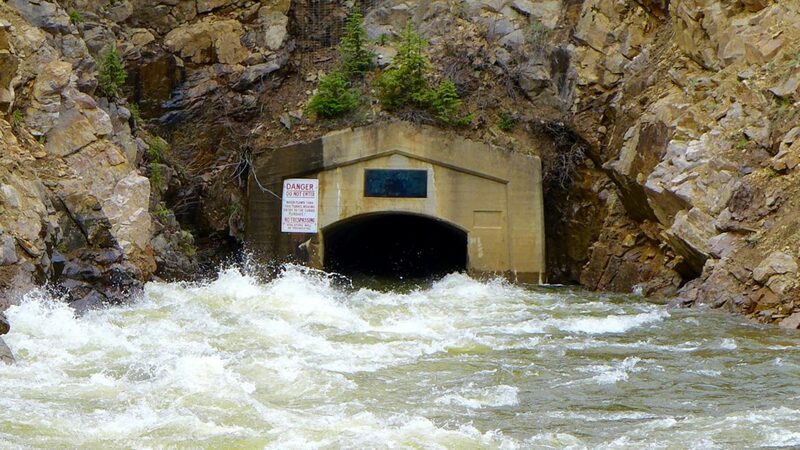 Last year, Twin Lakes was diverting 528 cfs when it suddenly closed the tunnel on June 4. A couple of days later, it diverted about 200 cfs for a brief time to try to reduce flooding of an old cabin along the river, and then, out of options, it left the tunnel closed until July 20. A graph showing the levels of diversion through the Twin Lakes Tunnel in May, June, and July of 2015. Last year’s non-diversion of water by Twin Lakes helped push the Roaring Fork at Stillwater to a peak flow of 1,680 cfs on June 18. The only minor damage caused in Pitkin County by last year’s high water was to the little cabin and a neighboring art studio. And to the delight of paddlers on the Stillwater section of river, the high water also formed “Lake North Star” on the North Star Nature Preserve. 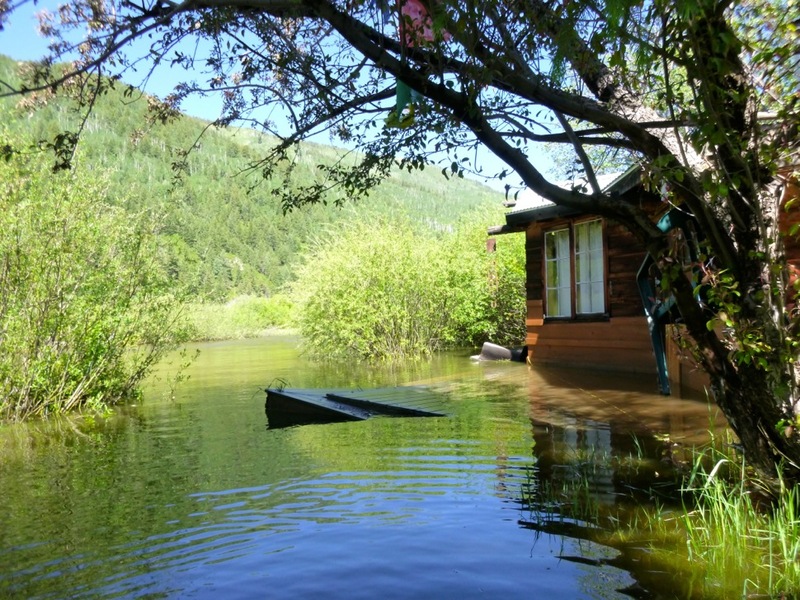 A cabin dating to the mid-1960s in the Stillwater section of the Roaring Fork River was flooded in June 2015, with standing water in the living room and in a nearby art studio. 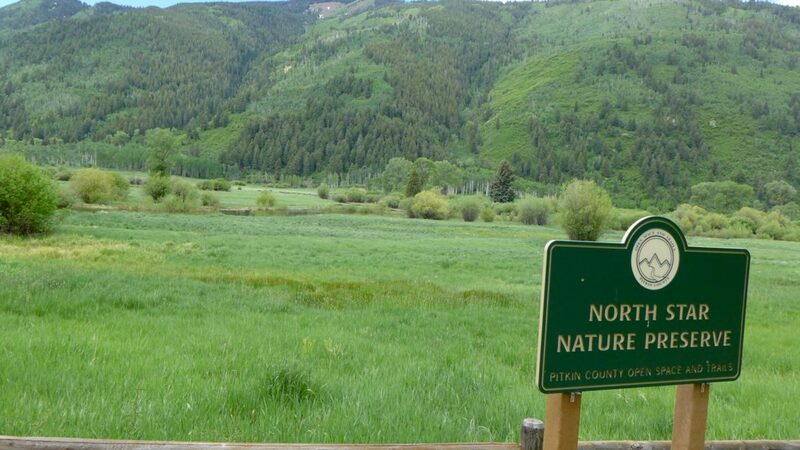 A large portion of the meadow in the North Star nature preserve east of Aspen was flooded in June 2015, allowing boaters in the Stillwater section of the Roaring Fork River to expand their horizons. It’s rare for Twin Lakes to stop diverting water, but it has constraints in its water-right decrees that can, in wet years, force it to stop moving water from the West Slope. Twin Lakes operates what is formally known as the Independence Pass Transmountain Diversion System. It gathers water from the Roaring Fork River and from Lost Man, Grizzly, Lincoln, New York, Brooklyn, and Tabor creeks, and delivers the water to Grizzly Reservoir. From Grizzly Reservoir, the water is sent through the 4-mile-long Twin Lakes Tunnel, under the divide, into Lake Creek and down to Twin Lakes Reservoir, on the east side of Independence Pass. The Twin Lakes Reservoir and Canal Co. is controlled by various municipal shareholders in the company, with Colorado Springs owning 55 percent of the shares, Pueblo 23 percent, Pueblo West 12 percent, and Aurora 5 percent. There are also other minority shareholders still using the water from the system for agriculture. One constraint in Twin Lakes’ water rights, which date to 1936, is tied to the Colorado Canal, which diverts water from the lower Arkansas River under a relatively junior water right. If the demands of the Colorado Canal can be met with “native” water from the Arkansas, then Twin Lakes cannot divert water from the West Slope to fill the canal. This year, there is a lot of water running down the Arkansas, and so the canal does not need supplemental water from the West Slope, at least not yet. The east end of the Twin Lakes Tunnel on June 6, 2016. The 4-mile long tunnel brings water from Grizzly Reservoir to Lake Creek, Twin Lakes Reservoir, and on to Front Range cities and fields. The other water-right constraint relates to how much water Twin Lakes can legally store in Twin Lakes Reservoir. 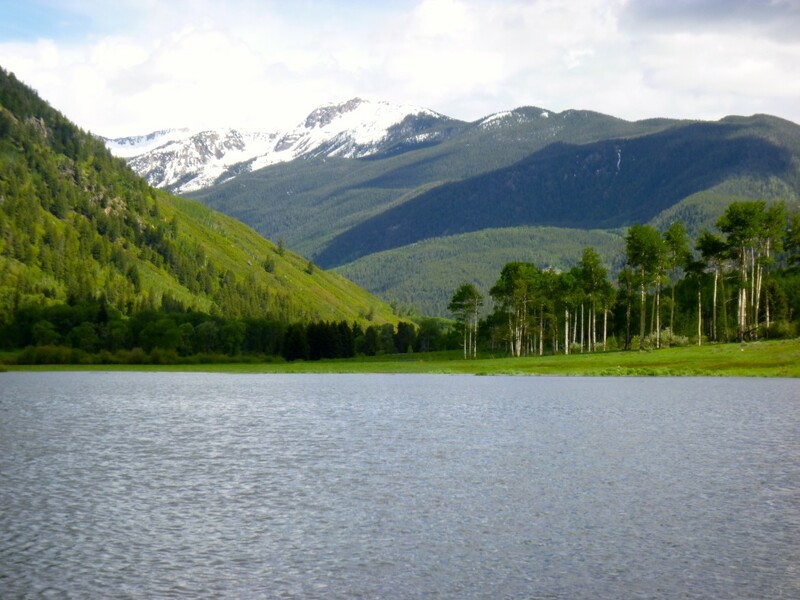 Once Twin Lakes, the company, has stored 54,452 acre-feet of water in Twin Lakes, the reservoir, the company has to stop diverting water from the Roaring Fork basin for storage. Normally by the time Twin Lakes has reached its storage limit, the flow in the lower Arkansas has dropped and the Colorado Canal gets called out by senior diverters, so Twin Lakes can send supplemental water to the canal, allowing the Twin Lakes Tunnel to divert all summer. But due to this year’s weather and snowpack, the constraints on Twin Lakes’ water rights have again come together, forcing the tunnel to be turned off as soon as the storage limit is reached, especially as the weather forecast suggests runoff into the Arkansas will remain high. The Colorado Canal in March 2016. If cool and wet weather were to materialize over the next few days, however, it could delay when Twin Lakes reaches its storage limit and has to stop diverting. It could be midweek, or it could be next week. And how long the tunnel stays closed depends on a range of factors, Lusk said, including weather, flows into the Arkansas, and the operation of Twin Lakes Reservoir. Valerie MacDonald, Pitkin County emergency manager, said officials with Twin Lakes have done a much better job this year than last year in communicating about the likelihood of a non-diversion. She also said local public safety officials are prepared to respond to high water and that concerned property owners can find information about flood readiness on the Pitkin County website. Editor’s note: Aspen Journalism and the Aspen Daily News are collaborating on the coverage of rivers and water. The Daily News published this story on Saturday, June 11, 2016.